Arcadia is an actual region of Antient Greece, a series of valleys surrounded by high mountains and therefore difficult of access. In very ancient times, the people of Arcadia were known to be rustic folk who led an unsophisticated yet happy life in the natural fertility of their valleys and foothills. Soon, however, their down-to-earth culture came to be closely associated with their traditional singing and pipe playing, an activity they used to pass the time as they herded their animals. Their native god was Pan.In the seventeenth century, the French painter Nicolas Poussin (1594-1665) used this pictorial tradition to paint one of his most famous canvasses, known as "The Arcadian shepherds" or as "ET IN ARCADIA EGO" (1647). This painting represents four Arcadians, in a meditative and melancholy mood, symmetrically arranged on either side of a tomb. One of the shepherds kneels on the ground and reads the inscription on the tomb: ET IN ARCADIA EGO, which can be translated either as "And I [= death] too (am) in Arcadia" or as "I [= the person in the tomb] also used to live in Arcadia." The second shepherd seems to discuss the inscription with a lovely girl standing near him. The third shepherd stands pensively aside. From Poussin's painting, Arcadia now takes on the tinges of a melancholic contemplation about death itself, about the fact that our happiness in this world is very transitory and evanescent. Even when we feel that we have discovered a place where peace and gentle joy reign, we must remember that it will end, and that all will vanish. This is a cool thread, let's revive it. In the first half of nineteenth century, intellectual life in Hungary turned towards the peasantry with increasing interest, and there was a great flowering of folk plays. Hungarian artists often painted gay feasts in the style of stage scenery. One of these in this picture by Ágost Canzi, which even in his lifetime appeared in polychrome and monochrome reproductions. August Canzi was born in Wien-Baden, studied in Paris and from 1846 settled in Pest. The War of Independence filled him with Hungarian national sentiment, and he even took to signing his pictures as Ágost in the Hungarian way. The gay vintage procession is carrying a Hungarian flag. With this seemingly unimportant detail, the painter wished to express the patriotic feelings of the people at a time of great oppression. I like this painting because the people all have very distinct personalities. Technically it is most difficult to render people, because unlike buildings and landscapes people have emotions and characters. 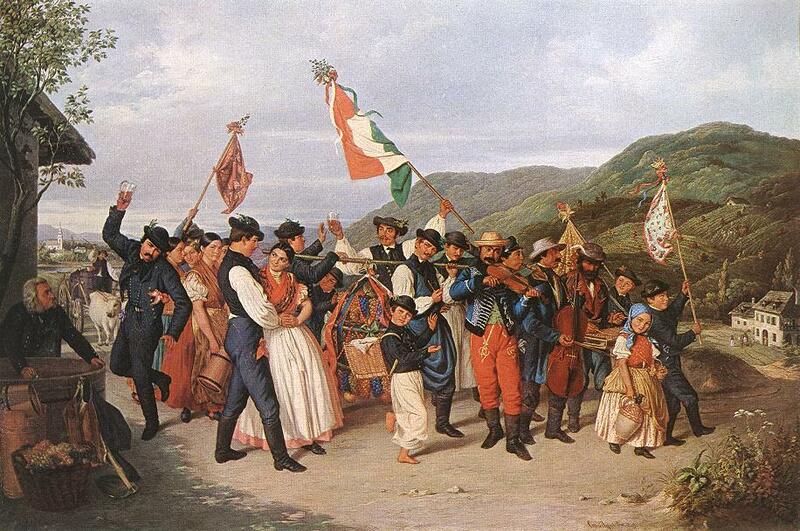 The proud little children, the romantic couple embracing, the shy girl carrying a jug, the patriotic man with the flag, the drunken man dancing (probably my favorite character haha), the dumb gypsy band in their garish clothes- everyone is a part of the scene yet feeling their own way about it. This site is a good source of European paintings. So hard to choose... But this is one of my favorites. 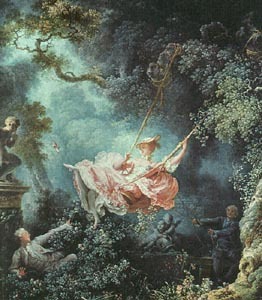 The Swing, by Jean-Honore de Fragonard. The Eye of Silence, by Max Ernst. Hey Adelaide, are you a monarchist, or what? I know you are, so I'm guessing there's also an intellectual reason behind your choosing of that specific painting as Fragonard was the painter of the royalty, and of the style Marie Antoinette so loved and cherished. Pushkin, what's interesting is that the first picture "Oath of the Horatii" you have pasted is the exact opposite style -both stylistically and politically- of what Adelaide had posted earlier by Fragonard. David was one of the revolutionaries and his style is very didactic and severely Neo-Classical, whereas Fragonard and his Rococo colleagues were painting scenes of court life exclusively for the members of the court. That's a good contrast, especially to have the two prominent examples of the two rival movements right after the other.